Mrs. Sokolov, a 9th grade social studies teacher, began a unit of study that corresponded with her state's curriculum standards requiring students to understand the role of citizens in a participatory democracy. She introduced the unit by engaging her students in an exploration of the civil rights movement. In planning the first day of the unit, Mrs. Sokolov gathered several articles that she had collected about President Obama, most of which mentioned the fact that he was the first African American to become president. Mrs. Sokolov figured that the best way to begin the unit was to read one of the articles aloud and ask her students to share their opinions about it. She jotted this idea down in her planning notebook. She planned to finish the opening lesson by asking students to identify key words that they would use to describe the significance of President Obama's racial background. This would be followed with a homework assignment to read a chapter from the course text about civil rights and prepare a list of related vocabulary words. Thinking that her first-day lesson plan was complete, Mrs. Sokolov went to the teacher's lounge for a cup of coffee. While there, she told one of the school's ESL teachers, Ms. Tedesco, how she planned to introduce the civil rights unit. In response, Ms. Tedesco said, "Have you thought about the students who have never experienced what it means to live in a democracy? Many of your ELLs come from countries that are not democracies." When creating activities to help ELLs connect to content, teachers should be sensitive to U.S.-specific elements that may seem unfamiliar to students from different cultures. We often take for granted that our students have prior knowledge about various people, places, things, and events. If a teacher has not activated prior knowledge or built background information about content material, teaching the vocabulary that is associated with the new content will not solve the problem. Just because ELLs may be able to read words doesn't mean they will understand their meaning in the context of the content being taught. Indeed, many of the ELLs in Mrs. Sokolov's social studies class were not familiar with the democratic process, let alone the specific language and content associated with it. The essential question that the school faculty had chosen for the year was, "What does it mean to live in a democracy?" At first, Mrs. Sokolov thought that teaching her students about the uniqueness of having the first African American president was a good plan. However, when she began thinking more deeply about the key purpose of her task, she realized that it involved much more than understanding and being able to use vocabulary associated with fighting for one's civil rights. She thought carefully about what it was that she wanted her students to learn. She developed a guiding question that she would post for her students: "How do civil rights affect your life?" By organizing her unit around this question, Mrs. Sokolov believed that she would be able to create and deliver lessons that would require her students to learn about the historical time period of the civil rights movement, and she felt that her guiding question related well to the school's essential question. Designing ways to explicitly guide ELLs as they practice using new language and content. Teachers also need to think about the visual aids that will best aid comprehension, how to simplify the language of instruction, and how to deliver instruction that is targeted to both the English proficiency levels of students and their grade-level content. Researchers Wiggins and McTighe (2005) point to the importance of "thinking backward"—that is, considering what it is that we want students to learn and how to assess it when planning learning experiences. When Mrs. Sokolov began to plan her lessons, she decided to change her guiding question from "How do civil rights affect your life?" to "What is a civil right?" to ensure that her ELLs understood the concept. Each of the activities that she designed was for the purpose of helping students answer this core question. She also began to think more deeply about the term "civil rights" and the ways in which she might modify the language of her lesson for ELLs without diluting the material. The more she planned, the more she realized that her lesson would be stronger for all of her students. Here are some of the distinct challenges in different content areas that ELLs face and that teachers should consider when planning lessons. 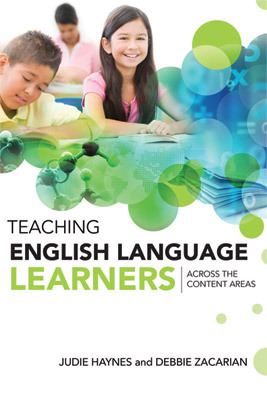 Many ELLs lack content area vocabulary and have limited comprehension skills in English. Although they may be able to sound out words phonetically, they may not be able to ascertain meaning from the context. English contains many idioms and figurative expressions that may be overwhelming to ELLs. Furthermore, the cultural background depicted in the text may be unfamiliar to ELLs. Because many ELLs write through the filter of their native language, word order, sentence structure, and paragraph organization in English may be problematic. There are a plethora of exceptions to the rules in English grammar. In addition, students often lack the vocabulary that they need to successfully write in English. It is important to remember that mathematical concepts are not necessarily universal. Math teachers need to validate the foreign systems of mathematics and prior mathematical knowledge that ELLs bring to their classrooms. Students may not show work in addition, subtraction, multiplication, and division, or may show such work in a different way. Concepts such as the Fahrenheit temperature scale and U.S. currency units may be unfamiliar to many ELLs. Teachers should also keep in mind that many cultures use commas where we use periods and periods where we use commas; for example, "1,067.32" would be written "1.067,32" in many countries around the world. English language learners may lack familiarity with the "hands-on" approach to teaching science that is common in the United States. Making predictions and drawing conclusions independently may also be difficult for ELLs. In addition, the vocabulary of science presents a difficulty to students who speak languages where there are no cognates. Directions often involve multiple steps and can consequently be difficult to understand. Science textbooks, which feature complex sentence structures and passive voice, can also prove challenging for ELLs. Social studies and U.S. history may be the most challenging content areas for ELLs, who may have very limited background knowledge to activate. As with science, textbooks will often contain an overabundance of complex sentences, passive voice, and pronouns. Students may also be unable to tell what is important in the text. Even maps have a nationalistic or cultural focus: In China, for example, the continent of Asia is in the center of the map and China appears larger than it does on U.S. maps. Echevarria and colleagues (2008) point to the importance of coming up with both language and content objectives for lessons to let students know what they are expected to learn. Language objectives refer to the specific vocabulary or use of language that teachers want their students to learn and use during a lesson. An activity related to a language objective might be as simple as, "Write two key ideas that your partner shares with you." For ELLs, the act of writing ideas must be taught explicitly. Content objectives refer to the subect matter information that you want students to know by the end of the lesson. Content objective: Today we will understand what a civil right is by listening to Martin Luther King Jr.'s "I have a dream" speech. Language objective: Today we will write down three civil rights that are mentioned in Martin Luther King Jr.'s "I have a dream" speech. To help students to meaningfully understand and express their understanding of the content, it is important to connect the lesson's core ideas to students' prior knowledge and experiences. Mrs. Sokolov's revised plan includes asking ELLs to discuss with their parents the kind of government and rights that people have in their home countries. Her plan also includes modeling the interview process. Modeling the tasks that we assign and engaging in think-alouds benefits ELLs greatly, as does guided practice. Many ELLs are not familiar with the step-by-step process of completing a task in a U.S. classroom. When Mrs. Sokolov jots down her think-aloud plan in her planning notebook, she notes the steps that she will model with her students as she prepares for the interview. Teachers should identify and compile any supplementary materials for their lessons in advance. Although Mrs. Sokolov had many newspaper articles about President Obama, she had not assembled materials about the various types of inequality that her students could discuss. She went to the guidance counselor to learn more about where her students had attended school and lived, then researched and found several Web sites about the types of political ideologies common to these areas. She also selected Web sites that contained news clips from various important events in the fight for civil rights. It is important to visually display both the language and content goals of the lesson. Goals should be written on the board, on chart paper, or on handouts. If they are written simply, they can greatly assist students. It is also a good idea to include pictures that realistically depict what is to be learned. Some teachers take their students on field trips to see and experience the content, often as a culminating activity at the end of a lesson. We suggest scheduling field trips for the very beginning of a unit instead, so that students can draw from the experience later. A good example is the teacher who takes students on a trip to a nearby garden, where she helps the students pick weeds. Upon returning to the classroom, the students staple their individual plants onto a piece of cardboard and begin labeling the parts. We believe that turning the core ideas that we want students to learn into open-ended questions and posting them on the board is an important aid for learning. Such visual representations are critical, because spoken language is fleeting; once we speak, our words can no longer be retrieved. Posting the core ideas as questions allows students to refocus, revisit, and rethink what is occurring. Mrs. Sokolov posted the following question in her room: "Are civil rights important in a democracy?" Graphic organizers offer students an important visual for examining the lesson's core ideas. We suggest that teachers use the same graphic organizer for similar tasks. A flowchart, for example, is used for describing a sequence of events. We also believe that all teachers in a particular grade level should use the same graphic organizers. Using similar graphic organizers throughout the school really helps ELLs comprehend the task at hand. When planning lessons, teachers must think about the formative and summative assessments that they will use to determine that students are learning key ideas. In Mrs. Sokolov's case, she also needs to ensure that the language that she uses in her assessments matches the English proficiency levels of her ELLs. (See Chapter 7 for helpful information on creating effective assessments.) It is essential to know the level of English proficiency of each ELL in the class and create learning activities and assessments to match it. As noted in the previous chapter, these levels range from beginners with little to no proficiency to students who are nearly proficient. Create a short skit about one important event that occurred during the civil rights movement. Find or draw illustrations depicting this event. Create a list of the key terms, words, idioms, and phrases (TWIPs) that will be used during the skit. Prepare to teach the vocabulary before presenting the skit. Present the skit to the class. Listen to other groups' skits and provide them with feedback based on whether the event was clearly described and key TWIPs were identified and displayed. After completing her lesson plan, Mrs. Solokov reviewed it one more time to ensure that it was suitable for the various proficiency levels of her ELLs, ensured that the material would be explicitly taught, and provided a range of direct examples of how she wanted her students to use language to express understanding. We suggest that classroom and subject area teachers complete the checklist in Figure 2.1 and the worksheet in Appendix 2 to help them modify lessons for ELLs. These modifications will benefit all of the students in the class. □ Plan resources, visuals, and vocabulary activities in advance. □ Act out vocabulary words and key concepts. □ Use visuals (pictures, videos, drawings, maps) to aid comprehension. □ Provide a study guide at the beginning of the unit. □ Identify content and language goals and write them on the board for students. □ Simplify your language: repeat, restate, reword. □ Arrange for students to work in groups. □ Explicitly teach vocabulary and provide students with word walls. □ Provide multiple opportunities to practice new vocabulary. □ Add a word bank to activities and tests. □ Give both written and oral instructions. □ Teach ELLs to underline or highlight main ideas in text. □ Assign a buddy to ELLs and arrange for tutoring. □ Modify instruction so that ELLs can participate in content area lessons. □ Tailor assignments to ELLs' levels of English language acquisition. □ Modify tests (e.g., by using word banks, simplifying language, asking fewer questions). □ Allow ELLs to show what they know in multiple ways (e.g., through oral responses, drawing, labeling, acting out answers). In this chapter, we reviewed various planning strategies that are essential to teaching ELLs in the content area classroom. We discussed identifying core ideas and posting them in the classroom, tapping background knowledge, preparing visuals to use during the lesson, using think-alouds, and creating small-group configurations. We also discussed the importance of providing students with multiple practice opportunities to think and learn. In the next chapter, we will further discuss how teachers can use small-group configurations to help ELLs learn academic content.